Good beef jerky does not need sugar. It’s no secret how much I love jerky. It’s how the entire line of Steve’s PaleoGoods came to life. The early days found me cutting, trimming, curing and smoking meat in my home kitchen with the help of my wife Kristen. Even then, I made a commitment never to add preservatives or sugar. I’ve built my company and complete line of Steve’s PaleoGoods staying true to that promise. Almost a decade later, jerky has gone mainstream. There are jerky sections in most grocers and convenience marts, as consumers have recognized the need for protein snacks while on the go. As with any pre packaged snacks, it’s very important to flip the pack and check the deck for ingredients you don’t want or need. 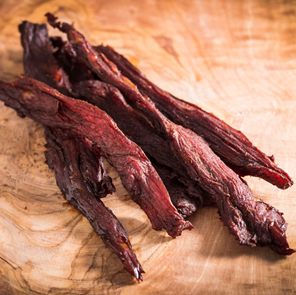 The very first ingredient on every pack of jerky will be BEEF or BEEF JERKY. Sounds like the same thing, but t’s actually far from it. In order to use the word JERKY in an ingredient list, the product must be made from a whole cut of meat. Think of the difference between a steak and hamburger. A hamburger is absolutely NOT a steak. Jerky made from cuts of whole meat will list BEEF JERKY in the ingredient deck. That’s what we make at Steve’s PaleoGoods. If the product you are holding is made from ground beef, it will list BEEF as the first ingredient. These meat snacks are created by grinding hamburger-like meat into paste, then using a machine to produce closely-packed strips. This process known as “chopping and forming” greatly reduces the protein content. Uniformly shaped meat snacks are highly processed. 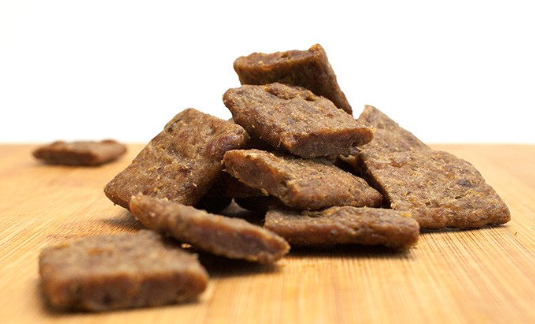 Chopped and formed products are often considered the same as true muscle-cut jerky, but it’s not the real deal. Many companies chop and form meat for the ease of making an evenly shaped product with an increased profit margin. Fillers like soy, starch and sugar are added to make up for the lost protein. It’s a scrupulous practice designed to fatten the bottom line. Sugar is the new S-word. It’s been linked to countless diseases and health conditions including obesity, heart disease and diabetes. Adding processed sugar to packaged goods enhances flavor and acts as a preservation agent while increasing product margin. Natural sweeteners like honey, maple and fruits are an investment most companies won’t make. When selecting any packaged food, look for ingredients ending in “ose” AKA sugar: dextrose, fructose, glucose, lactose, maltose or sucrose. Syrup? Another popular sugar alias. When you check the deck of one of the leading retail meat snacks, you will note the second ingredient after BEEF is CANE SUGAR. Our Original PaleoJerky contains ZERO grams of sugar per ounce. Even our Sweet Southern BBQ Jerky sweetened only with a small amount of honey and fruit contains 2 grams of sugar per ounce. 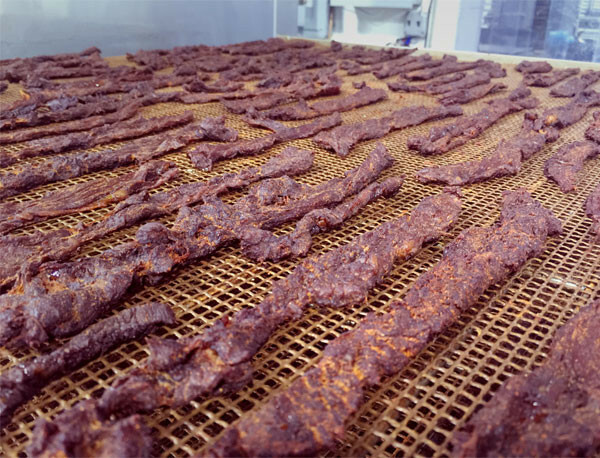 We will never add preservatives, sugar, soy or starch to our Paleo Jerky. Our vacuum packed seal holds in juices while keeping air out. When you start with high quality cuts of whole muscle meat, all you need is a little spice and a slow roast to achieve jerky perfection! We source our Black Angus beef meat from New Zealand, where grass grows year round and does not require chemical treatment. Our cows are pasture raised and never receive hormones or antibiotics. Ever. We believe in the handcrafted difference, and we don’t use machinery or low quality cuts of meat to save on the bottom line. Crafted by hand and slowly smoked to perfection for the most delicious result, we naturally cure our meat for long periods of time to add flavor and eliminate chemicals. I love eating jerky. While Steve’s is obviously my favorite, I enjoy sampling others and learning as much as I can about the industry. Before I try anything, I’m always sure to flip the package to check the deck of ingredients. The nutritional content will immediately dictate how much I eat or even whether I will try it or not. I prefer save my sugar for a weekly ice cream treat…for my jerky I prefer spices and MEAT!